I signed up for the Ghosts of Yellowstone 100 on a bit of a whim. After an untimely fever forced a scratch at the August 2nd Elkhorn 50, my plan of running the IMTUF on September 20th lost its appeal. I wanted to race, and as soon as possible. The Ghosts of Yellowstone was just a couple weeks away and as Montana’s only 100-miler, I figured I had to give it a shot…plus Mystery Ranch was putting up $1,000 in prize money to sweeten the deal. Seth had a fun time running it last year, my fitness was starting to come into good form and I was feeling confident I could once again get ‘round one of these things. With classes set to begin the following Monday, it was a bit of a scramble to leave town. I had meetings all day Wednesday and Thursday, but was able to sneak out a bit early in order to make it the pre-race meeting in time to turn over those drop bags to the aid station folks. A quick drop, some basic course information and I was off to Pony to get some sleep. Pony is a classic Montana cowboy town. Not much to it. I found a level place to park the truck and gobbled some dinner as rather dramatic thunderstorm moved in. With no place dry to go other than my truck, I retreated to the cap at about 7:30 and hunkered down with my book. It pelted rain throughout the night, a precursor to race day weather, but I slept quite well, waking sharply a 4:00 ready to down some breakfast, brew some coffee and get on with it. It was barely not raining at the start and that buoyed my spirits considerably – starting wet is just plain unpleasant. A small tribe of 20 or so toed the line and set off in the pre-dawn light. Just as soon as I started to revel in a relaxed starting pace, one young fellow darted off like he was running a 10k. Slightly annoyed, I gave chase and resolved to keep him at least within eyesight on the day’s first climb. After only a mile or so, he was already a minute ahead – fast or stupid or maybe both. The first several miles grind up an abandoned fire road, gaining a high ridge 2,500 feet above Pony. I slowly reeled the rabbit in and pulled alongside, introducing myself. Chris’s (now that I new his name) response, “Justin Angle…yeah I know you…I used to read your blog when I was in high school!” That cut. Cut me deep. “Dude, I turn 40 on Monday and I’m not exactly looking for more things that make me feel old.” We chatted a bit more, contemplating the day before us, and then I slowly eased ahead, finding a nice rhythm over the ridge and down into the abandoned mining town of Murdoch. I bypassed the aid station here (mile 8) and strode on to the Curly Lake trailhead at mile 12.7, climbing a 1000 or so feet up a progressively degrading doubletrack. The smell of fresh weed greeted me at the aid station. 7:55 AM…a little early to be burning so hot, fellas. Nonetheless, the two guys manning the aid helped me locate my drop bag, reload some water and head out onto what would (much later) become the crux move of the course. The stretch from Curly to McGovern covers almost 17 miles, climbing up 4,000 feet to a high pass at just below 10,000 feet. This trail was absolutely the highlight of the course…mountainous, technical and exposed, offering sweeping views during the rare moments the low – and lowering - ceiling allowed. The climb gained steepness toward a high junction at 9,000 feet. I had not seen a course marker in quite some time, but I knew I was at the southern end of the course and needed to head north, making the decision to turn right at the unmarked intersection relatively easy. From here the trail climbed steeply to a pass taking me across two open alpine meadows, meadows in which the trail disappeared. What was easy navigation on this outbound leg was sure to be tricky on the return so at several spots I made the point to turn around and take a good look at what I would be facing 50 or so miles hence. The descent off the pass was sweet…rocky and steep at the top giving way to bomber singletrack all the way down to the McGovern aid station. McGovern, by the way, was the first of 5 out-and-backs embedded within this larger 90-mile out-and-back. I didn’t feel stellar heading down, a little stiff and awkward, but the mind was good and the guts intact. The aid station crew seemed surprised to see me, which is always a boost, and I reloaded my gels and Omnibars in short order. Then I entered the washing machine portion of my day – rinse and repeat. I mentioned the 5 out –and–backs, well, they were pretty uneventful. Each descent/ascent was 2,000 or so feet of similar profile – sub-alpine at the ridge to high pine forest, to open range land, to rugged two-track falling steeply to the valley floor. I stayed steady – never felling too good, never feeling too bad – and was able to check in with other runners, get a sense of my lead (it was thankfully significant), and manage negative slits on my second laps of Rock Creek and McGovern Creek. Throughout, the aid station crews were quite pleasant, though I could tell they were growing anxious about the evening ahead. You see, ominous weather was on the move. Never climbing out of the 40’s, the day brought intermittent showers, none of which quite motivated me to don my Houndini jacket. But as afternoon crept on, the clouds grew deeper and darker and the air acquired a distinctly damp chill. As I topped the final climb of McGovern, I saw Chris just about to descend, looking fresh and in good spirits, but likely 2+ hours in arrears at this point. To this point, though I had yet to really feel good, I knew I was moving relatively well. At mile 61 the aid volunteers told me I was 10 minutes ahead of Seth’s and Zack’s split from last year. Who knows how accurate that was, but it brought confidence and reassurance that I was making good progress. Parting ways with Chris I turned and resumed the climb – that same climb I previously referred to as the crux move of the day – knowing I was now the only person on the south half of the course. By now the rain was steady and darkness creeping. I pulled out the Houdini and my gloves and rigged my headlamp for the evening. Each step of ascension brought thicker fog and more intense precipitation. Gaining the technical switchbacks of the final ridgeline, I first flicked on my headlamp, only to see the fog completely swallow the beam. It was dark, but just enough twilight remained to make my way, motivating me to reach the two aforementioned meadow sections before losing those last glimmers of illumination. At the first meadow, the trail tapered away just as I remembered. I pressed on, now fully engulfed in dark, headlamp consuming fog, feeling around for the fairly run-out cairns guiding the route. Not feeling quite confident, my vector began to descend a saddle – this wasn’t right; I had one more steep pitch to climb. I backtracked, then sidetracked, then other-sidetracked, finally returning to the spot at which I accessed this wall-less maze. Realizing my initial mistake, I worked left and soon found the desired steep pitch, picking up the goat trail and feeling, at least temporarily, secure. That security, however, came only from knowing I was on route. My 15 or so minutes of wandering left me alarmingly cold and with rain giving way to sleet and snow, any margin for addition error was gone. One more meadow to go and then hopefully descending a few thousand feet would bring some degrees and an escape from the fog. I crossed that second meadow rather uneventfully, recalling a slight angle to the right and a distinctive cairn. Now on the descent, I needed to run and run hard to bring back some body heat. Behind on calories and shivering, I pushed as best as I could, though the fog made running almost impossible. I desperately needed my headlamp, but even its super powerful Roch Horton-modified beam could not pierce that fog. I stripped it off my head and held it low to the ground, working my way off the ridge like an old man working the beach with a metal detector. Finally back beneath treeline, the fog relented and the sleet turned to rain. With some tree cover over me and an Omnibar in the belly I regained a small bit of warmth, but at this point what was left of a race was quickly becoming a survival mission – I had a big lead, there was $1,000 to be won, and any chance of running close to Seth’s time was now out of the question. Just get through this thing in one piece became the mantra, and I clung to 2 notions to keep me moving. The first was the makeshift aid at Curly Lake. Two fellows I had seen on the outbound were making camp at the lake and informed me that their eventual ambition was to achieve aid station status. Perhaps they had made some progress during the 10 or so hours between my visits. Approaching the lake basin, their impressive camp fire caught my eye and I hopefully inquired as to the possibility of a hot beverage. Not their fault…but kind of a kick in the balls at that particular moment. My second point of hope was the potential arrival of Beau Fredlund, fellow Omnibar athlete, overall mountain adventure stud and good friend. Beau is a prolific ski mountaineer and guide and has traded the sticks for kicks this summer in preparation for The Rut. A few days before the race, I pitched the idea of 25 or so miles of pacing work and he jumped on it. Not quite knowing if he would actually materialize – this is remote terrain with challenging logistics – I descended the Curly drainage with moderated optimism – Beau would be a boost, but I was mentally prepared to go it alone. Sure enough, Beau appeared about 2 miles out from Curly and his energy immediately lifted my spirits. I brought him up to speed as he brought me up to speed, enthusiastically snapping photos as we approached the aid station and a resupply. We made quick work of the aid and kept moving. Temps continued to dip and the rain/sleet was intensifying. If I hadn’t realized it earlier, I now firmly knew that this night was going to be about one thing and one thing only…stay movin’ – stay warm. Beau kept the mood light as we trudged our way up the steep pitch from Murdoch. We gained the ridge and shuffled down toward Pony and with every step I started to wonder just little a bit if Alex (RD) might shut this thing down and not allow us to hit the 10-mile finishing loop?” Oh, yes, I neglected to mention that…after the 90-mile out and back from of Pony, the course took us away from town around a 10-mile alpine loop. Now stumbling a bit on my clubby, icy feet, we got a visual on the aid station and some potential warmth. The crew seemed pretty exuberant as we rolled in. “Why the hell you boys out here running?” I just responded with “Beau, can you see if they have any soup?” He poked into the tent only to find a smoke-filled and whiskey-drenched scene. Nope, this was not the aid station. We had fumbled into a bachelor party and the partiers were just as confused by us as we were with them. As we scurried away, I asked Beau, “why the f@ck would anyone have a bachelor party out here in this ridiculous weather?” He paused, allowing me to grasp the elementary and painful irony of that question on my own. That small detour made for a few good miles of stories, propelling us to the aid station proper. Mile 90. 12 to go, with a 3,000 or so foot climb. By now I was about as cold as I could tolerate. Unable to really get words organized and out of my mouth, I forced some soup and warm water and off we went. They said 4 up and 6 down, then 2 into town…we’ll see. Just keep moving…stay movin’-stay warm. And so for the next 3+ hrs, we made our way around that God-awful loop, mocking our hypothermic selves and doing our best to stay on the route. Type 1 fun had ceased long ago, leaving us in the Type 2 category, with occasional dips into Type 3. But we kept moving, Beau maintaining the positive mood with stories of imaginary beaches and questions about the feasibility of insect agriculture. Monosyllables and grunts were about all I could add to the conversation. There was one lonely aid station on this section…not so much an aid station as an outpost with two burly folks tasked simply with validating our completion of the loop. Somehow they had a fire, burning brightly in the deluge. I sat in front of that thing for about 15 minutes, soaking up as much warmth as I could through my sopping layers – two Cap 1 long sleeves, 1 Houdini and 1 Alpine Houdini. That fire melted my Houdini pants, fusing them with my skin, but it was so very worth it. Alex and a few others were waiting at the finish, quite enthusiastic that I made it round in one piece. I lingered for a few moments, then shuffled up to the Pony school, grabbed my duffle and headed straight for the bathroom. No shower, but a hot water sink-splash session felt pretty darn nice. Within about 20 minutes I was soundly asleep in the truck. Warm at last. I’ve been somewhat nonplussed by this experience. Sure, I made it through a 100 after some recent struggles. 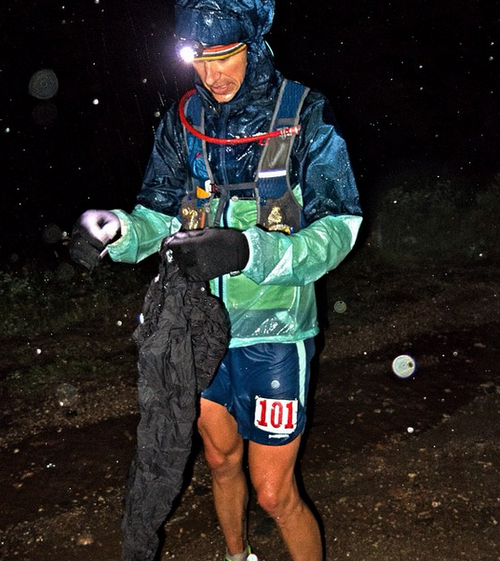 It was a tough one – 28k of climbing through rugged, remote terrain and challenging weather. I managed a win and some cash. All good things. I’m certainly uncertain about the fun involved – in the late stages it was negligible, but it’s an accomplishment nonetheless. Until a day or two after the race, I was under the impression I was the only finisher, adding to my ambivalence. Four other hearty folks made it round, however, facing those elements for a minimum 9 hours longer than I did. Can’t even begin to imagine that. Can’t thank Beau enough for his colossal effort…you are the man and that’s a fact. Alex and crew put on a solid event in the most challenging conditions and seemed to keep everyone in good spirits. Maggie and the girls put up with a lot this summer to give me this chance and my gratitude for their support, patience, generosity and love fueled every step. Love you guys! Patagonia Strider Pro Shorts, Patagonia Cap1 short sleeve, Patagonia Cap1 long sleeve (2x), Patagonia Houdini, Patagonia Alpine Houdini, Patagonia arm-warmers…made into leg warmers. Loads of Omnibars, gels, some soup and the occasional Coke.